Indian Army Notification is out. Indian Army is recruiting for 14 JAG Entry Scheme Govt Job Posts. You can check Indian Army - Indian Army last date, download Indian Army notification, visit Indian Army official website and check other Indian Army Vacancy details.Complete Vacancy and recruitment Details about 14 JAG Entry Scheme Govt Job vacancies in Indian Army are provided below by JobSarkari.Com only for you. Last Date of Apply Online. 14/02/2019. JAG Entry Scheme 23rd Course. 07. 07. 14. Candidate Must Have Passed Bachelor Degree in LLB With 55% Marks And Must be Eligible For Registration As An Advocate With Bar Council of India/ State. Running. 2.4 Km in 15 Mins. 2.4 Km in 15 Mins. Sit Ups. 25 Nos. 25 Nos. Push Ups. 13 Nos. 13 Nos. Chin Ups. 06 Nos. 06 Nos. Rope Climbing. 3-4 Mtrs. 3-4 Mtrs. 3. Candidate Need to Fill All the Details in Application Form And Need to Upload All Mandatory Documents As Mentioned in Notification. 4. Candidate Need to Apply Online on or Before 14th February 2019. Q. What is the Last Date For Indian Army JAG Entry Scheme Govt Job Vacancy ? A. 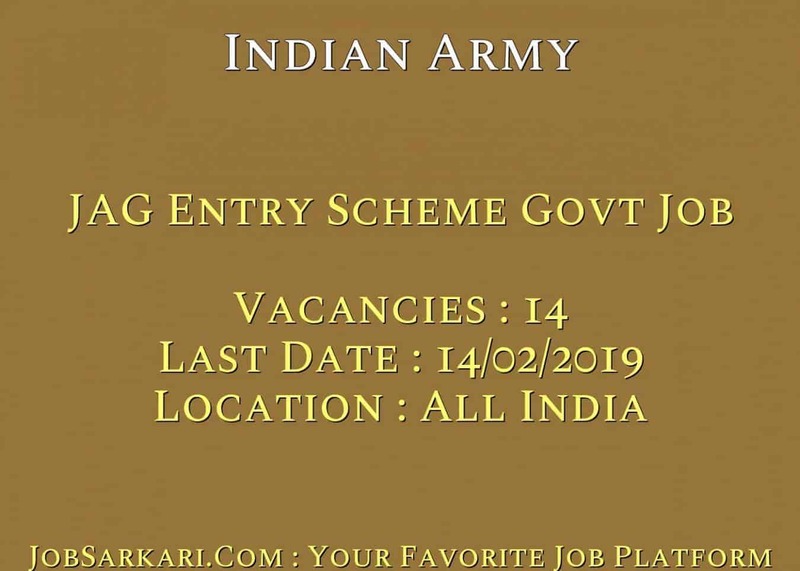 Last Date for Indian Army JAG Entry Scheme Govt Job Posts is 14/02/2019. Q. What is the Form Type of Indian Army JAG Entry Scheme Govt Job Recruitment ? A. The Form Type for Indian Army JAG Entry Scheme Govt Job Posts is Online. Q. 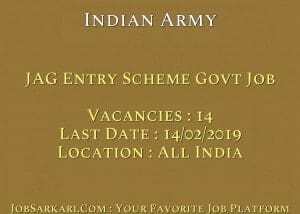 How many vacancies are available in Indian Army JAG Entry Scheme Govt Job Posts ? A. There are about 14 Vacancies in Indian Army JAG Entry Scheme Govt Job Posts. wale student can apply this form. No You Can’t Apply For This..